Sean Baker is one of the best filmmakers working today. His filmography has deftly examined the lives of those who live in society's margins, often unseen and ignored. One could say that he is perhaps one of our most quintessentially American filmmakers, exploring our country through the eyes of those on its periphery. The symbolism of that has never been so potent as it is in his latest film, The Florida Project. Named for Walt Disney's original designation for the Orlando theme park that would one day become Walt Disney World, The Florida Project follows the lives of a group of young children who live in a seedy hotel on the outskirts of the Disney parks called the Magic Castle. Covered in garish purple stucco and home to all manner of societal outcasts who are all but homeless, the Magic Castle is a kind of haven for those who have nowhere else to go. Our guide into this world is Moonee (a remarkable Brooklynn Prince), an adventurous and preternaturally sassy little girl with little respect for authority and a rich fantasy life. She, along with her friends, Jancey (Valeria Cotto) and Scooty (Christopher Rivera), spend their days spitting on cars, begging for free food, and roaming all over the shabby tourist district they call home, defying adults and adulthood at every turn. Moonee also spends a large amount of time with her mother, Halley (Bria Vinaite), a loud, foul-mouthed hustler who sells counterfeit perfume on the street in order to pay the rent (and sometimes stealing away to catch a glimpse of the Disney World fireworks bursting in the distance). Mooney and Halley have a tenuous existence, rarely able to make ends meet, barely hanging on to what meager life they have. And yet Moonee is blissfully unaware of the decay that surrounds her. As their innocent childhood play soon takes a dark turn, Moonee's seemingly idyllic world soon begins to crumble around her, as circumstances she could never understand puts her on an inevitable path that will likely determine the course of the rest of her life. There, in the shadow of the happiest place on earth, childhood comes to a screeching, painful halt. I can't remember the last time a film so indelibly captured the cycle of poverty and abuse that keeps so many in this country down. With his shot-on-the-fly, cinéma vérité style, Baker treats each character with dignity, never condescending to them or the situations in which they find themselves. Instead he offers a clear-eyed portrait of abject poverty and the choices families must make in order to merely scrape by. The film unfolds like a modern piece of neo-realism, capturing life seemingly as it happens. And yet the narrative beats are so masterfully composed that we almost don't notice them until they sneak up on us, maximizing their emotional impact. That the film is set in an area of wealth with a renowned veneer of joy is no mistake. Poverty is all around us, even within spitting distance of Walt Disney World. It is as if here they are even more invisible, overlooked in a tourist mecca built on an illusion. Baker is known for working with non-professional actors, and the cast here is one of the finest he has ever assembled. He makes people who have never acted before, and coaxes out brilliant, multi-layered performances that have more authenticity than many Oscar-winners. These people have seen the things they portray, and you can feel the world-weary resignation in their eyes. Brooklynn Prince is a revelation, turning in perhaps the most fully realized and utterly heartbreaking performance of the year. She, along with Willem Dafoe as the Magic Castle's long suffering manager, give the film its heart and soul. From Prince of Broadway (2008), to Starlet (2012), to Tangerine (2015), Baker has given voice to the voiceless, exploring America's oft-ignored underbelly with an uncommon sense of joy. He finds happiness in the darkest of places, and The Florida Project is like a shot of pure, childlike glee. And yet, it is never far away from the inherent tragedy at its heart - that the future of these children is ultimately bleak. What makes it such a remarkable film is how Baker gives it all such a sense of hope, no matter how faint, in the innocent optimism of its young characters. It's a warm, winning, heartbreaking, and deeply moving portrait of those for whom the childlike wonder and happiness that Disney World represents is always in sight, but forever out of reach; a haunting reminder of the increasingly fading hope of the American dream in decline. It's Baker's finest work yet. 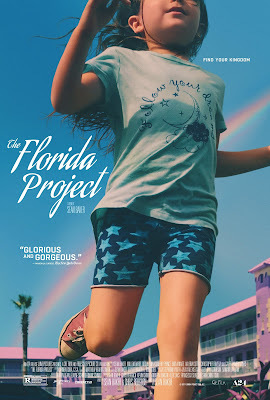 THE FLORIDA PROJECT | Directed by Sean Baker | Stars Brooklynn Prince, Willem Dafoe, Bria Vinaite, Valeria Cotto, Christopher Rivera | Rated R for language throughout, disturbing behavior, sexual references and some drug material | Now playing in select cities.